The Stephen Phillips Memorial Scholarship believes that limited financial means should not hinder students’ access to college. In the United States the wide gap between the rates of college graduation for our wealthiest and poorest students is alarming, yet we know that a college degree is the key to a productive and successful future. For this reason we partner with over 60 organizations who work with under-represented student populations in hopes of financially assisting some of these students as they work toward college graduation. These organizations work with youth in New England urban and very rural areas. They give personalized attention to support low-income and/or first-generation-to-college students as they prepare for college. These students are encouraged to make informed college decisions through the guidance and mentoring of their partner organizations. Identify prospective Phillips Scholarship applicants and help them complete and submit the Phillips application. Complete a recommendation form for each of their applicants. Applicants must add their counselor/mentor’s name and email in the Recommendation section of the application so that the recommender can receive an email with a link to the applicant’s personalized recommendation form. Complete the Applicant List Form prior to the April 3 and May 1 deadlines. Aid in the application process by acting as a liaison with the student should we have questions or concerns beyond the application. If their applicant is awarded a Phillips Scholarship, it is expected that they will stay in contact with the Phillips Scholar throughout college and assist with future renewal applications, financial forms, and issues that could impact their Phillips Scholarship. View a list of Partner Organizations. If you have any questions about the Phillips Scholarship process or about becoming a partner organization, please call Executive Director Barbara Welles Iler at 978-744-2111 or email her at bwiler@spscholars.org. This form helps us identify students from your organization. The Applicant List Form can be filled out more than one time, if necessary. Helping a student with the Phillips application? Applicants should request their partner organization advisor to fill out a General Recommendation Form by filling in the advisor’s name and email address in the Recommendation section of the application. This recommendation should be the second general recommendation, the first should be a teacher or another adult who knows you well. These two general recommendations are in addition to the applicant’s Guidance Counselor Recommendation Form. As soon as the student saves that portion of the application, all recommenders will receive an email recommendation request with a link to the applicant’s personalized recommendation form. This form should be submitted by the recommender by May 3rd, 2019 (or April 5th if the student is applying for an Early Response). 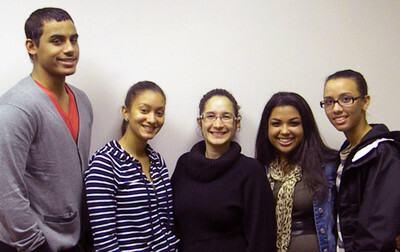 Victor (Manny) Cruz and Yibelis Pena (both Northeastern University), Jesenia Tejada (Salem LEAP College Success Coordinator and Phillips Alumna), Scarlett Gonzalez (Endicott College) and Johanna Rodriguez (Northeastern University). Upward Bound – Lyndon State College visits Salem! This is a group of rising seniors. They visited the scholarship office for a discussion about college admissions, financial aid, and the scholarship application process. They then toured the Phillips Trust House.